Directions: Massage rich lather into wet hair and rinse. 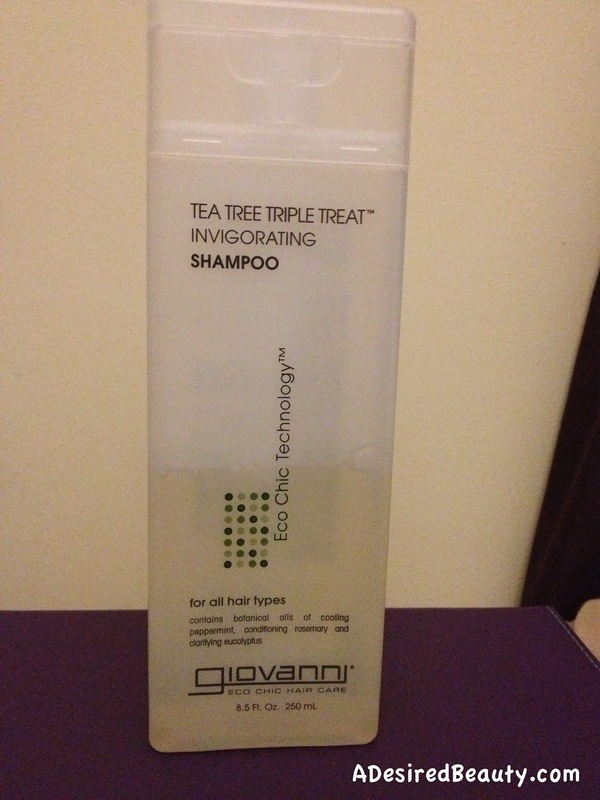 Follow with Tea Tree Triple Treat Conditioner. Ingredients: Aqua (Purified Water), **Aloe Barbadensis (Aloe Vera) Leaf Juice, Sodium Cocoamphodiacetate, Lauryl Glucoside, Sodium Cocoyl Glutamate, Sodium Lauryl Glucose Carboxylate, Decyl Glucoside, Cocamidopropyl Betaine, Menthol, Panthenol, Potassium Sorbate, Citric Acid, Polysorbate 20, *Melaleuca Alternifolia (Tea Tree) Leaf Oil, *Eucalyptus (Eucalyptus Officinalis) Oil, *Thymjs Vulgaris (Thyme) Extract, *Urtica Dioca (Nettle) Extract, *Tussilago Farfara (Coltsfoot) Flower Extract, *Sativa Officinalis (Sage) Leaf Extract, *Rosmarinus Officinalis (Rosemary) Leaf Extract, *Lavandula Angustifolia (Lavender) Leaf Extract, *Equisetum Arvense Extract, *Chamomilla Recutito (Matricaria) Flower Extract, *Achillea Millefolium Extract, Phenoxyethanol, Mentha Piperita (Peppermint Oil). *Certified Organic By Guaranteed Certification Services. **Certified Organic By Quality Assurance International. My experience: I have mixed emotions about this shampoo. When I first got it, I was unimpressed and my hair felt blah after using it. It's only redeeming quality was the tingling on my scalp. I'm a sucker for the essential oil tingle on my scalp. So, I tried using it with my staple shampoos: CON Moisturizing Argan Oil and Shea Moisture African Black Soap and I felt like it brought my favs down! Strike #2. I gave up on it until I was having issues with my scalp while I had my box braids. I reached for it for some help relieving my scalp and it worked like a dream. My scalp loved this shampoo during my box braid wash days. That made me decide to try it again after I removed them and that was the last strike. (You can read more about that experience here.) My hair felt so gross after that. It just seems to me that my scalp loves this shampoo, but the length of my hair hates it. It's problematic. The shampoo itself has a strong, mint & menthol scent. Just like with the conditioner, the scent of the shampoo makes sense based on the ingredients. I don't think it's quite as medicinal smelling as the conditioner is though. It's clear and very soapy like, read: it has a lot of lather for a "sulfate free" shampoo. Now, I am not a girl who's all against sulfate shampoos or anything, I just happened to try out a couple sulfate free shampoos and loved them. This shampoo, however, doesn't compare to those two... especially when it comes to the ingredients. There are a number of organic, plant-based cleaning agents & bubble producers in this shampoo, and they're all higher up in the ingredients list than the essential oils and extracts that the shampoo boasts about. So perhaps my hair does not like these eco-friendly cleansers? I really don't know. Either way, I'm definitely only cleaning my combs and brushes with it now. Has anyone else tried this shampoo? Like it? Love it? Never want to use it again? Woop for clean combs and brushes! At least you found a way to make it work for you--even if its not necessarily for your hair. It took me forever and a day to realize that my hair doesn't care for many shampoos in general, so I have a lot of shampoo to use to clean my combs! Lol yes I actually got the idea of using it that way from you! So thanks for sharing that tip.